Mortgage Principal Reduction Coming Your Way? Have you been making your mortgage payments on time, even if your home value dropped and never rebounded? Stop reading now. This blog is N/A to you. What?? Let’s start by going back in time. The FHFA has been seeking a way for underwater home owners to be given a real chance to keep their homes. On March 21, Joe Light of the Wall Street Journal tweeted that the FHFA may have found the way to do that – albeit for just a few of those in the same predicament. He gave more details in, “Fannie, Freddie to Cut Mortgage Balances for Thousands of Homeowners”. The following day, Housing Wire reported a similar message. But specifics were still unknown. 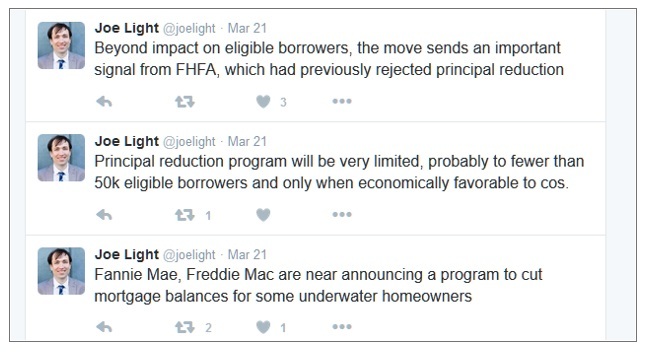 FHFA’s principal reduction program is expected to be eligible for roughly 33,000 “underwater” borrowers. Principal reductions may be offered to borrowers who occupy the applicable home as their primary residence. Said homeowners must be 90 days’ delinquent in their payments as of March 1, 2016. This makes the program ineligible to anyone who stopped making payments after December 2015. The eligible mortgages must be less than $250,000. The value of the mortgage amount compared to the home value (the LTV) must be greater than 115%. Eligible loans are mainly in Florida, New Jersey, New York, Illinois, Ohio, Pennsylvania, Nevada, and in the “hardest hit communities”. Borrowers must have a first-lien mortgage that is owned or guaranteed by Fannie Mae or Freddie Mac. The idea of principal reduction has been hotly debated. For years, no one thought it would never happen. And recently, Housing Wire quoted FHFA Director Mel Watt at a public policy luncheon hosted by the Women in Housing and Finance, where he said that the issue of principal reduction has been the “most challenging” that the FHFA has faced in his two years there. Watt also said that his objective for any principal reduction plan was to achieve a “win-win” situation for borrowers and the GSEs alike. According to the FHFA, this program will give seriously delinquent, underwater borrowers their “last chance” to avoid foreclosure by providing principal reduction. The principal reduction requirements and stipulations are different than the GSEs currently streamlined modification programs, the FHFA said. “In existing Streamlined Modifications, servicers capitalize outstanding arrearages into the loan’s principal balance; set the loan’s interest rate to the current market rate; extend the loan’s term to 40 years; and, if a borrower has a MTMLTV ratio greater than 115%, forbear principal to 115% of the MTMLTV ratio or 30% of the unpaid principal balance (UPB), whichever is less. Principal forbearance defers payments on a portion of outstanding principal until the end of the loan and makes it non-interest-bearing. This reduces a borrower’s monthly payment but, unlike principal forgiveness, does not reduce a borrower’s overall indebtedness. While 33,000 borrowers may be eligible for the principal reduction program, the FHFA opines that far fewer will actually take advantage of it. According to the FHFA’s documentation, only 9.5% of eligible borrowers take advantage of the streamlined modification program. Therefore, if the same percentage of eligible borrowers elect to participate in the principal reduction program, only 3,155 borrowers will see their principal reduced. The FHFA further notes that there are “reasonable grounds” to expect that more borrowers will participate in the principal reduction program than in the streamlined modification program. This is because similar programs have never been offered; they expect much public interest will motivate eligible borrowers to participate; and support from “outside organizations” increases the likelihood of higher participation rates for the principal reduction modification compared to the streamlined modification. Surely the program has numerous detractors. For example, Carrie Hunt, the general counsel of the National Association of Federal Credit Unions, stated in National Mortgage News, "It is extremely difficult to envision a scenario where principal reduction will do anything to strengthen the housing market," she said. "NAFCU strongly supports protecting consumers, but again, we believe that principal reduction sets a dangerous precedent." By the end of 2015, over 4 million borrowers owed more than their homes were worth, according to CoreLogic data. Of course, regardless of the LTV, many of those home owners are still making their mortgage payments. I had a high school friend who would force one of her parents to write her a “Please Excuse” note every time our school featured a paraplegic speaker who had been drinking and driving and, subsequently, severely injured. While the goal was, of course, to convince students to never do that, my friend was appalled that the school never invited a supremely successful young adult who never chose to drink and drive and who, as a result, attained lofty heights because s/he did not chose a different course. For up to 33,000 Americans, either they have been offered a break or have had someone hit the “do over” button on their behalf. This mini magic wand solution should spread to other industries such as the beauty market. Imagine a pill, cream, or treatment that would remove those 15,000 hours of sun exposure and the subsequent facial wrinkles it produced, for example. I am mostly joking and you would think I’d learn by now to exclude all editorial comments. In last month’s Blog, I had to go and mention Ocwen and the lousy service it provides. Not two weeks after publishing, you guessed it. 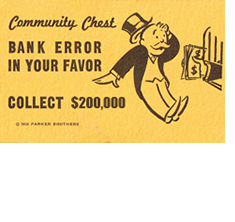 I received yet another erroneous you-owe-us-too-many-thousands-of-dollars-for-your-incorrect-escrow account. Now I’ll have to spend untold hours attempting to resolve that. So let me close by saying congratulations to and urging the 33,000 eligible borrowers to take advantage of this Watt and FHFA supplied ‘escape key’. You get another chance at paying off your home loan! If it doesn’t work out for you, perhaps Ocwen will refinance your home loan?